The History of this golf club is rich in vision, hard-work, perseverance, dedication and character. This is derived and contributed by many men and women who have given freely of their time and energy for the benefit of all members who wish to play the game they love since 12th August 1905. Miramar golf club is part of the establishment of the city of Wellington with members coming into the club over the years from all walks of life. Miramar fortunately has had a strong base over the years of committees and boards that have fought many battles with Wellington Airport, their closest neighbour, who has continually required land for future development. 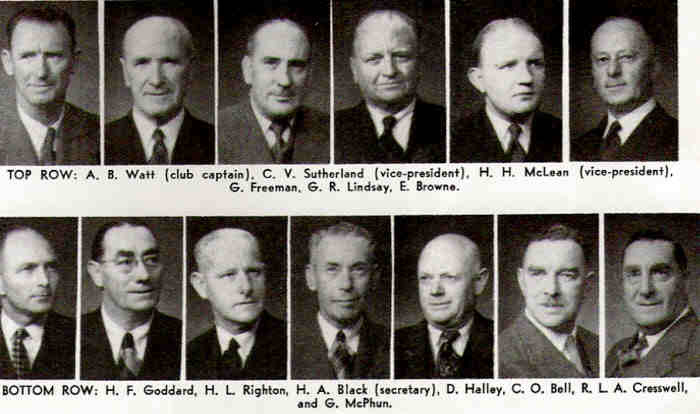 It is due to those past and present members that the club exists. In 1905 a group of Wellington men with an avid interest in playing golf discussed the feasibility of establishing a second club in the Wellington city area. A committee was set up and within a short time a lease was taken over some land in the suburb of Karori farmed by the Campbell family. The foundation team of F.J.Jones, Dr. A.N.Jones, Dr. Izard, C.W.S.Cox, R.Swanston and C.E. Finch set about building the course and within three months twelve holes were ready to play. Opening Day was set down for 12th August 1905. In 1906 eighteen holes were complete with the first club championship being played and won by Mr. C.E. Finch. His winning gross score was 102. For three years the game prospered in Karori but one Saturday afternoon in 1908 the Captain was required to inform the members of the Campbell's family decision to give notice to the club to quit as they wished to sell the land. In the weeks following the Captain and his team of dedicated golfers had inspected three sites and also looked at amalgamating with either the Hutt or Wellington golf clubs. The determination to continue with an independent club separate form the two Hutt Valley courses was rewarded with the news that the land the Wellington Golf Club had vacated some years earlier in the Miramar peninsula might be available. The initial layout of just eleven holes was ready for play in April 1909 when family and friends staged a gala carnival with special trams hired to bring the people from the city to the course. Miramar Golf Club was re-born and over the next four decades flourished to become one of the leading clubs in New Zealand. Over this period the club hosted the New Zealand Open Championship, The New Zealand Ladies Amateur and the New Zealand Amateur. The end of the 2nd World war signalled the opening of a long innings by the administrations to safe guard their links from their neighbour, the Wellington Airport. In 1954 the government took 5.25 hectares and in 1971 the club lost another 8.2 hectares.In 1972 the club found that the government wanted the balance of the course and would pay $3 million to the club. During the next three years the club was left in limbo with the committees provisionally looking elsewhere to re-build the course. Prior to the General Election in 1975 this proposal fell through. In 1992 the airport again looked at purchasing a major part of the course with the possibility that the club would be left with only enough room for nine holes. With golf club and community support against the proposed airport plan, changes were made that allowed the club to remain an eighteen-hole course. In 1993 Graham Marsh Golf Design were asked to prepare a Master plan of designing a new 18-hole course within the confines of the club's new boundary. In 1994 work commenced on the new course with members continuing to play 18-holes. This was made possible by juggling the old course and the new holes as they came on stream. Twelve months later in August 1995 Miramar was set to start another chapter in its history. As Graham Marsh (course architect) said, Miramar will always be remembered by me as a golf course that was redesigned for all the right reasons-a membership that bonded together to protect their love of the game within the confines of their property.